For the estimation of the pollutant concentration along roads, it is essential to simulate exactly the causal relationship between emission, transmission and immission. What comes out is a dispersion model. In our case, the calculations were conducted by the Dr. A. Lohmeyer Engineering Office in Karlsruhe on the basis of the PROKAS calculation model and in consideration of the road network tangent to the plan area. The basic factors that are included into the model are traffic-related data (traffic volume, road behaviour, diurnal changes in traffic and emissions), meteorological aspects (wind flow classified into 36 different wind direction categories and 9 different wind speed categories as well as dispersion conditions classified into 6 different dispersion categories) and geometric conditions (topography). The above-mentioned dispersion categories take into account that the rarefaction of the exhaust gases depends on both the wind and the stability of the atmosphere. The calculations comprise the ambient air concentration of nitrogen dioxide (average annual value and 98 percentile as a measure for short-term peak concentrations) as well as the average ambient air concentrations of benzene and soot. The mentioned components usually pose the biggest problems for air hygiene. These components are also relevant for traffic restrictions according to §40 (2) of the Federal Immission Control Act. The model calculates the concentrations in a way that the actual ambient air concentration is estimated slightly higher and the authorities stay on the safe side when they deliver estimations in terms of air hygiene. The model determines the total ambient air concentration from the properties for basic pollution and the additional traffic-related pollution. The figures that are available from the table at the bottom of the page represent the results of the calculations for the years 1995 and 2000 (with unchanged traffic routing and constant traffic volume). What you can see in the figures is a generally high concentration of all represented components along the roads, while pollution decreases with the distance to the roads. This way, narrow pollution corridors are formed. The average nitrogen dioxide concentration for the reference year 1995 partly exceeds the limit value from TA Luft (80 µg/m³) in Willy-Brandt-Straße/Cannstatter Straße (at the A-road B 14) and around Heilbronner Straße (at the A-road B 27) for example, while the ambient air concentration of nitrogen dioxide in the inner area of the Rosensteinpark only reaches values between 25 and 40 µg/m³. A decrease in the ambient air concentration of nitrogen dioxide is discernible until 2000 but even then, the concentration in the proximity of roads will clearly exceed the limit value of 50 µg/m³. The short-term concentration of nitrogen dioxide along heavily frequented roads (Heilbronner Straße, Pragstraße, Wolframstraße, Willy-Brandt-Straße, Cannstatter Straße) partly reaches more than 160 µg/m³ in 1995. These values exceed the inspection value of the 23rd Federal Immission Control Ordinance for traffic guidance and restriction measures. In areas far from roads, the short-term values drop to about 50 µg/m³ and the ambient air concentration will drop only slightly until 2000. The average benzene concentration also exceeds the inspection values of the 23rd Federal Immission Control Ordinance in 1995, which is 15 µg/m³ and 10 µg/m³ along main roads. It is the same for soot, which exceeds the inspection values of 14 and 8 µg/m³. 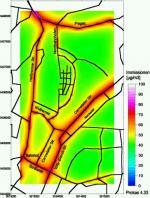 The benzene concentration far from roads, however, drops to between 2.5 and 5 µg/m³, that of soot to between 2 and 4 µg/m³. The ambient air concentration of benzene is expected to decrease significantly until 2000. The target values for air quality (according to table 7-3), determined by Stuttgart's city council, have in some parts not yet reached the values intended for 1997 (target value 1) on the basis of the 1995 conditions. Figure 7-2 shows that this target vales is still exceeded as for the average nitrogen dioxide concentration in Willy-Brandt-Straße/Cannstatter Straße, Heilbronner Straße, Wolframstraße and Pragstraße. As for the short-term concentration of nitrogen dioxide, the target value is only exceeded at one calculation point at the Pragsattel ridge. It is the same for the average soot concentration, which only exceeds the target value here. The classification of the calculated benzene values ends with the category > 15 µg/m³. The target value of 25 µg/m³ is exceeded at six points. Despite a generally decreasing concentration, target values will still be exceeded in 2000 as they will be fixed on a lower level. This is also shown by the coloured arrows, which mark the individual target values for 1997 (violet), 2000 (red) and 2005 (green) in the colour immissions scales in figures 7-2 to 7-9.